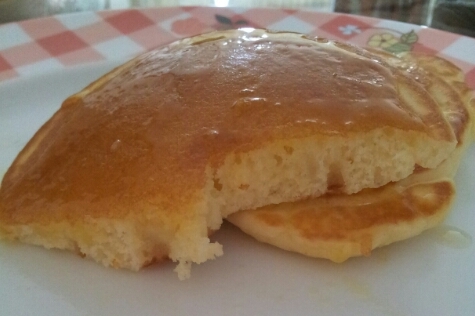 This is a light and fluffy pancake, just like the one serve in McDxxxxx. The batter is extremely easy to make and it only takes few minutes to prepare, and when that’s ready, frying the pancake is just another few minutes task. A perfect breakfast. 1. Mix flour, sugar and salt in a mixing bowl. 2. Add in eggs, milk, corn oil. Stir to combine with a hand whisk. 3. Spoon the batter onto a non-stick pan ( I used Happy Call Pan ) without oil and pan fry until golden brown on both sides. 3a. If using HCP : heat HCP over low heat for 2 minutes. Spoon the batter onto the pan. Cover the lid. 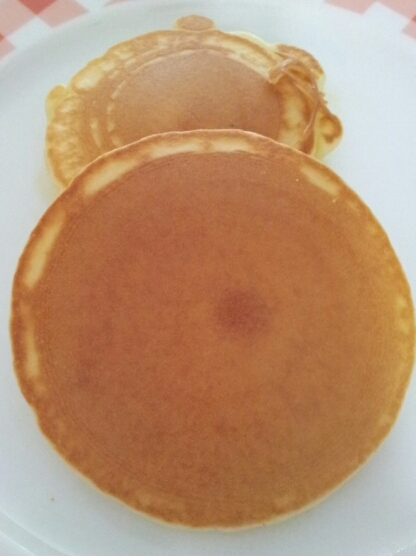 Once the batter starts to bubble and bottom is nicely browned, flip the pancake over, cover the lid and cook for 1-2 minutes. 4. Serve hot with honey and butter.